The chip could challenge Qualcomm’s 64-bit flagship Snapdragon 810, which is considered one of the faster 64-bit processors and is due to appear in more than 60 devices this year. MediaTek didn’t present benchmarks, saying that on paper its CPU specs could outperform rival products. A big advantage of the Snapdragon 810 is integrated LTE, which the new MediaTek chip doesn’t have. 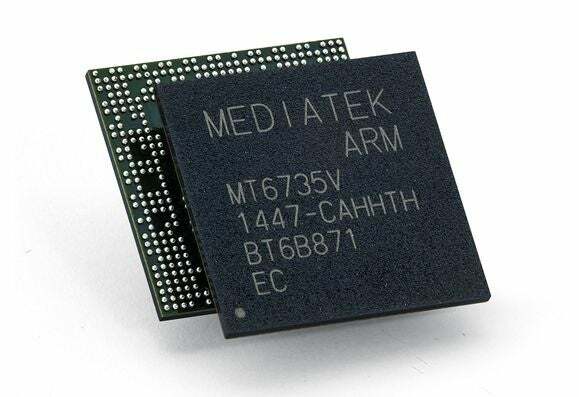 MediaTek does offer the LTE-capable 64-bit MT6795 chip, which has eight cores but can only support 2048 x 1536 pixel displays. The quad-core MT8173 is roughly six times faster than its predecessor, the MT8125, which shipped in 2013 and was used in many smartphones and tablets. The new chip pairs two CPU cores based on ARM’s recently introduced Cortex-A72 design with two low-power Cortex-A53 cores, which can handle mundane tasks like video calls and MP3 playback. The chip operates at clock speeds up to 2.4GHz. Many existing 64-bit chips—like the Snapdragon 810—are based on the older Cortex-A57 design, and the Cortex-A72 is considered speedier. 4K video decoding and encoding capabilities come through a PowerVR GX6250 graphics core. Tablets with screens up to 13 inches still don’t have—and may not get anytime soon—4K screens, but images can be streamed to attached 4K monitors. So, it may be possible for tablets to receive and process 4K streaming video from a service like Netflix, and then play it back on a TV. The chip supports HDMI output to hook up TVs and tablets.